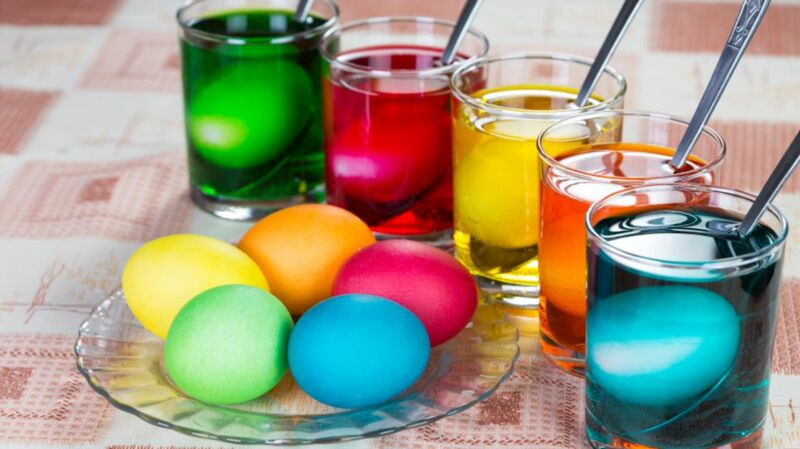 Every year, as Easter approaches, people across the globe hardboil eggs and dye them brilliant colors. Where did this tradition come from? There's no one answer to that question—in fact, there are many accounts as to how dying eggs became a part of the tradition surrounding the Christian holiday of Easter. Here are five of them. Eggs were often associated with pagan festivals and celebrations of spring. Eggs were symbolic of rebirth and new life, making them an appropriate part of the celebration of spring and the new life that comes after winter. It was common for eggs to be decorated in conjunction with these spring festivals, and common to see these colored eggs given as gifts to friends and family. The symbolism of rebirth fit well with the spring holiday of Easter, as it is the celebration of Jesus’ resurrection. The practice of decorating eggs and giving them as gifts was adopted by Christians and included in their Easter celebrations. According to Volume 5 of Donahoe's Magazine, a monthly Catholic-oriented general interest magazine that ran from 1878 to 1908, early Christians in Mesopotamia dyed eggs red to mimic the blood that Christ shed during his crucifixion. The church purportedly took up this tradition and it has continued ever since. King Edward I of England may also have contributed to the tradition of decorating eggs to celebrate Easter. In the 13th century, Edward I ordered 450 eggs to be colored and decorated with gold-leaf. They were presented as Easter gifts to the rest of the royal household. In several legends, Mary Magdalene is a key player in the creation of the egg-dying tradition. One version involves Mary Magdalene’s trip to Jesus’ tomb three days after his crucifixion. She carried a basket of cooked eggs to share with the other women who would be mourning at the tomb. When she arrived to find the stone rolled away from the entrance and the tomb empty, the eggs in her basket turned a brilliant shade of red. Another legend tells of Mary Magdalene going to speak to the Roman Emperor Tiberius after Jesus rose from the dead. She greeted the emperor by saying “Christ is risen.” Tiberius replied, “Christ has no more risen than that egg is red,” gesturing to an egg that was, depending on the version of the legend, on his table or held by Mary herself. As soon as the emperor said this—you guessed it—the egg turned red. Some Eastern European legends credit not Mary Magdalene, but Jesus' mother Mary, as the source of the egg-dying tradition. Mary was present at her son’s crucifixion on Good Friday and, according to these legends, she brought eggs with her. In one version, blood from Jesus’ wounds drops on the eggs, coloring them red. Another version of the legend tells of Mary weeping, begging the soldiers at the cross to be less cruel to her son. She gives these soldiers eggs and, as her tears fall on them, they are spotted with brilliant color. This post originally appeared in 2013.